FARNBOROUGH, United Kingdom, July 16, 2014 – Boeing [NYSE:BA] and MG Aviation Limited today finalized an order for two additional 787-9 Dreamliners, valued at $499 million at current list prices. The order will support the leasing company’s growing fleet of modern airplanes. Pictured from left: Ralph Nakash, President, MG Aviation, Ray Conner, president and CEO, Boeing Commercial Airplanes and Joe Nakash, Chairman, MG Aviation. 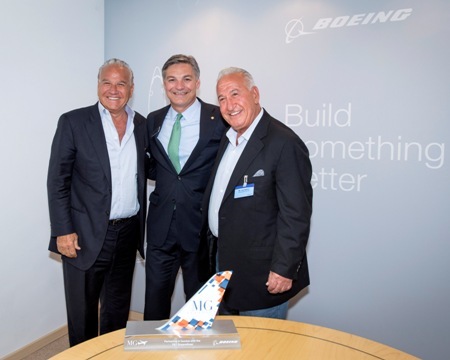 FARNBOROUGH, United Kingdom, July 16, 2014 /PRNewswire/ -- Boeing [NYSE:BA] and MG Aviation Limited today finalized an order for two additional 787-9 Dreamliners, valued at $499 million at current list prices. The order will support the leasing company's growing fleet of modern airplanes. "The 787-9 will be an excellent addition to our leasing portfolio, enabling us to provide our customers with exceptional range, increased capacity and superior economics," said Joe Nakash, chairman of MG Aviation. MG Aviation previously placed an order for two 787-9s in 2006 and now has four unfilled 787-9s orders. "MG Aviation is growing its leasing portfolio by acquiring airplanes like the 787-9 that help to set its customers apart from the competition," said Todd Nelp, vice president for European Sales, Boeing Commercial Airplanes. "The 787-9 is a great addition to any carrier's fleet, offering superior passenger comfort, increased cargo capacity and low operating costs." The new 787-9 Dreamliner will complement and extend the super-efficient 787 family. With the fuselage stretched by 20 feet (6 meters) over the 787-8, the 787-9 will fly more passengers and more cargo farther with the same exceptional environmental performance — 20 percent less fuel use and 20 percent fewer emissions than similarly sized airplanes. MG Aviation is part of Jordache Enterprises, the Nakash family's global conglomerate that also operates Arkia Israeli Airlines, serving domestic and European destinations from its base in Tel Aviv.